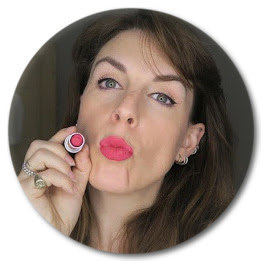 Being a make-up artist and writing about beauty, make-up and skincare means I'm not slavishly loyal to any brand. I try what I get my hands on and if it works I'll keep using it until I find something better. 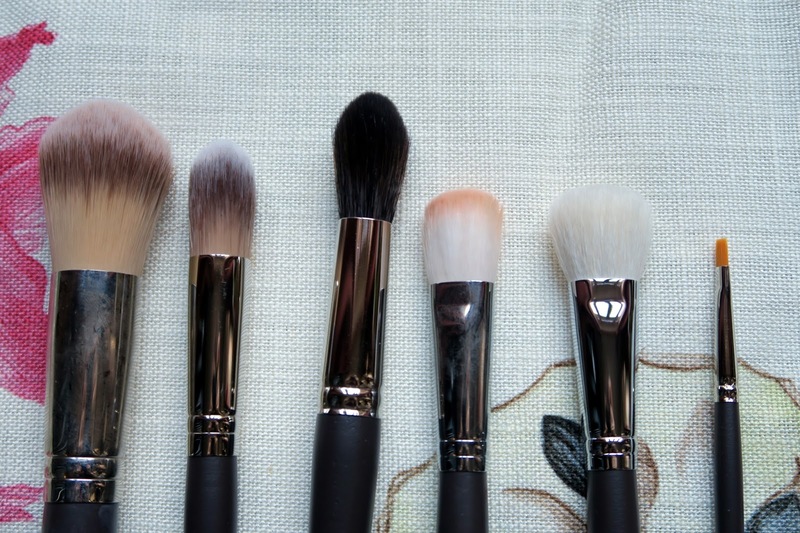 For many make-up artists brushes are an almost guilt-free shopping pleasure. You always have an excuse to buy new brushes, there's nothing worse than not having the exact one you want to hand and no one likes having to clean brushes mid-way through a job so it's best to have plenty to hand. And ones that can do more than one thing are often the best. However, if I was told I was only allowed to use on make of brushes both in my kit and on myself there's no question that Louise Young Cosmetics is the brand I'd go for. And I'm not alone. 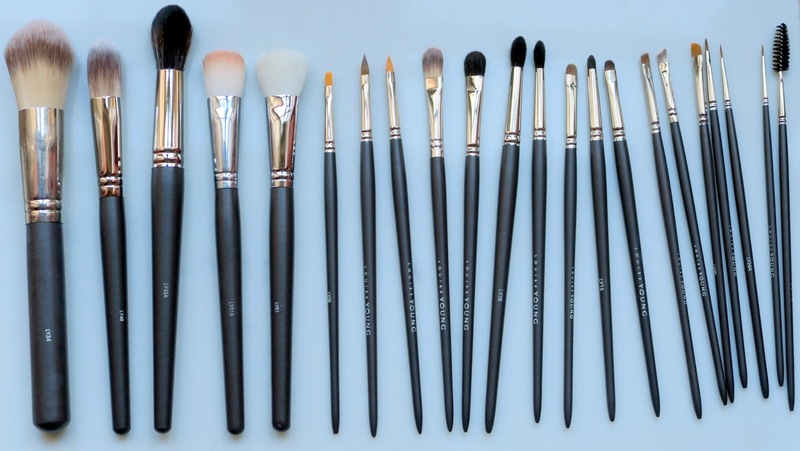 Her brushes are found in kits all over the world - in TV studios, film sets, bridal specialists and the backstage areas at all top fashion shows. And with good reason. These brushes are handmade in the UK (you can see how in the video link below) and all created by Louise, one of the hardest working artists in the business and a complete perfectionist. All the brushes (and the make-up in her range) are made for her, they are things she wants to use when she's working. Which means I've yet to use one of her brushes and not really get why it's in the range. Because all her brushes are great I have pretty much the full set in my kit and in my personal set. They are easy to clean and, looked after properly should last a long time (I've added a link below to a how to clean your brushes video. 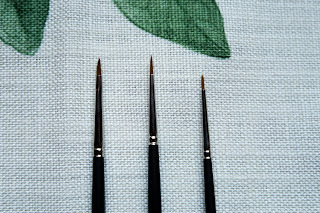 If you don't do it properly you will damage your brushes). 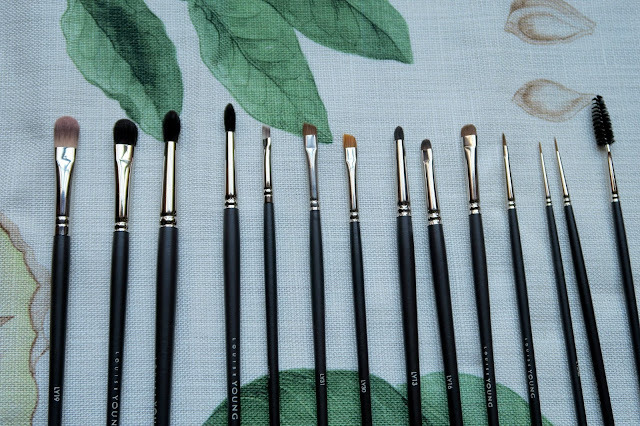 The best place to get hold of these brushes is through Louise's website so I've described each brush from my collection below to make your purchases a bit easier. I'm nothing if not an enabler and these brushes are incredibly reasonably priced. There is a mix of natural and synthetic hair so if you want a selection of vegan friendly brushes you'll be able to find them in this range and I love that they are made in the UK. First to the face brushes and her bestseller the LY34 Super Foundation brush (£24) which features in my kit and my own brush pot. This synthetic brush not only applies and blends foundation but you can use it for powders too so if you are someone who does their base with their hands then this is good for blushers and bronzers too. The LY48 Mini Super Foundation (£19) is another great synthetic all rounder and more suited to those with a smaller face. I love this for cream contouring. The LY49A Deluxe Small Powder Brush (£27) is one of the softest brushes I've felt and new to Louise's collection. This is natural hair so good for powder based products - my go-to brush for blusher application. They LY51 (£20) and LY51A (£19) are basically the same Buffing Brush but the LY51 is natural hair while the LY51A is synthetic (and I use it for cream blushers - as you can see from the pinky peach tinge in the picture!) The LY28 (£9) is actually a flat lip brush but I love this for precision concealing and as it's synthetic it works well with any kind of creamy concealer. The Super Foundation brush may be the bestseller but for those in the know I think it's Louise's angled and fine liner brushes that I've seen most frequently in the kits I've nosed through. The LY19 Eyeshadow taklon (£11) is great to put colour all over the lid, the synthetic bristles make this great for cream shadows too. The LY39 Domed Shadow (£17) is a natural hair brush, beautifully soft and a great size for quick effortless shadow application. 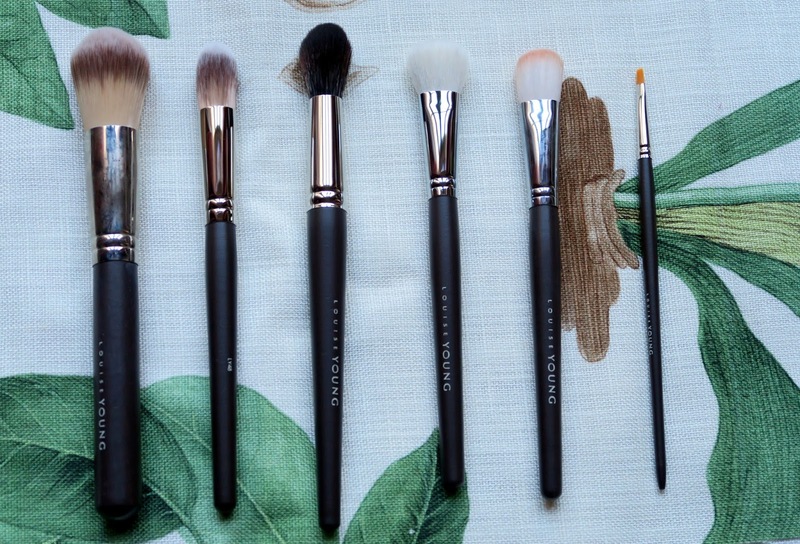 I love Louise's blending brushes and here I've shown the LY38 (£17) and LY38B (£15) are tapered shadow brushes with natural hair, great for defining the crease or blending. The LY37 is a taklon brow brush (£9) which I also love to use for a gel liner. The LY31 (£13) is a natural hair brow brush and LY30 (£10) is a mix of natural and synthetic hair and perfect for precision brows. The LY13 Mini Socket Brush (£11) and LY16 Eye shadow Sable 3 (£9) are my two favourite brushes ever and I have at least three of each, they are so useful. 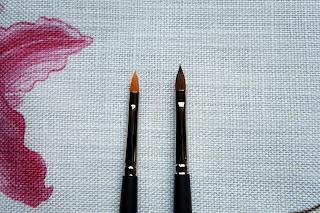 These two can do a smokey eye in a few minutes flat - the LY16 blending along the lashline and out at the corner and the LY13 taking it from the corner up to the crease. For cake and gel liners the Louise Young liner brushes - LY23, 24B and 24A - are all amazing, choosing one just depends on personal preference and mine is probably the 24B. All natural hair and priced from £9-£11. The LY22 (£6) is a mascara brush but actually this is a must have for neatening brows. Lastly two more favourites. I find a good lip brush hard to come by and these two are fantastic. Well the synthetic LY26 (£10) is actually a pointed concealer brush and really great for covering spots or pin-point blemishes. I have mine in my kit with my lip-brushes because that's what I always need the most of. If I'm doing extras or a bridal party the last thing I want is to be having to constantly cleaning the same lip brush so it's great to have a few to hand. The LY27 (£15) is a natural hair version. The versatility of these brushes is a large part of their appeal. Lip brushes for concealing, foundation brushes that do blushers, buffing and contouring. They are a great length and beautifully weighted. When my goddaughter is old enough I will be buying her a set of these, everyone who's into make-up should have some. If you need help on how to clean your brushes you can see my video here. You can check out the full Louise Young range of brushes here.